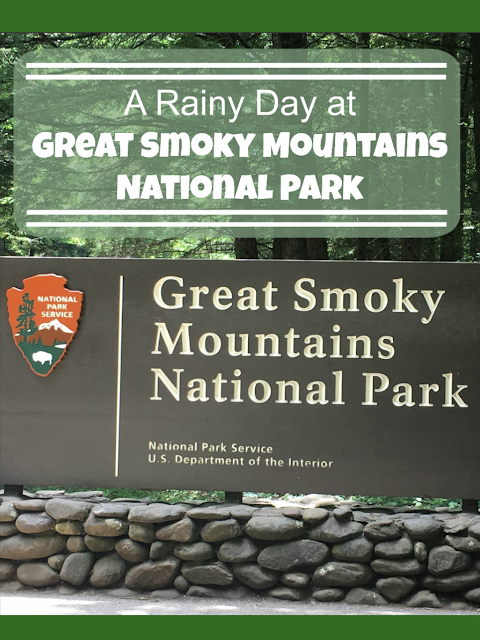 When we were in North Carolina, for a wedding in July, we took a day to drive through Great Smoky Mountain National Park. Seeing each of the NPs in the US is super high on my bucket list and this was actually the first one we have had the chance to visit, so I was all kinds of excited! However, the day we were going was actually looking a bit dreary. Halfway through the day it start to drizzle and then it really picked up! We still had an awesome time!! We aren't ones to let the rain really keep us from enjoying the fun! As long as it was just drizzling, we found great little spots to get out and hike around. The rain actually made things seem just a little more mystical and alive in my opinion. It made the trees glisten and you could almost smell the earth under your feet! Pick a few spots that you would really want to get out and just be prepared to enjoy the rain drops. One place I would really recommend getting out at is the Mingus Mill. For the most part you stay pretty covered while you explore the mill itself, but even the short walk down to the end of the mill, where it meets the river, has good tree coverage so that you don't get as wet. This spot also happens to be where we saved a baby mole that had fallen into the trench and couldn't get out, so it's got some pretty solid memories for us! Driving through the park will not disappoint! Even if you hate the rain, and don't want to get out of the car, you can still see so much. You can pull up next to each of the overlook areas and take in the views from your window. They aren't called the Smoky Mountains for nothing and even from behind a windowpane you can see the smoke-like clouds perfectly! 3.) Head to the Visitors Center! There are actually 4 different visitors centers throughout the park. We stopped at the Sugarlands Visitor's Center, which is the closest one if you are coming in from Gatlinburg. It had a few fun exhibits going on and there is also a free 20 minute film that you can catch on the history of the park. We didn't watch it, but many people were there to see it. We stocked up on maps and information and made our way onward. *Note: They ask for a donation of $1 for each of the bigger maps. We only had $5, so we took information on some of the trails and falls too, which came in very handy. As we were exiting the park, on the opposite end, we passed the Oconaluftee Visitor's Center, which has a farm museum attached to it. You can explore the workings of an old mountain farm and check out the log cabins, barn, smokehouse and other buildings that they have on site. We were running out of time to stop, so we didn't get to check it out this time, but it looked like a lot of fun! 4.) Take in a Tasting! Right before you enter the park there is a great little winery. It was actually sunny here when we visited, but you could see the clouds rolling in. Cade's Cover Cellars has really yummy wine and the tasting was a lot of fun. I mean, how cute is that little bear's nose?! It's a great spot to wait out the rain to see if it might pass so that you can enjoy more of the park! Tuckaleechee Caverns is a great spot for staying clear of the rain! While it was still sunny when we visited both the caverns and the winery, you could see the storm clouds looming. On the opposite foot, if it's a really hot day, the caverns are an awesome place to escape the heat. We saw the sign for the caverns on our way towards the national park. When we went to the winery we asked about the tour and hour long it might take, because we didn't want to take too much time away being in the park. Though the girl doing the tasting told us it might take a little more than an hour, we figured we would give it a shot. I am so glad we did! Seeing the caverns was an amazing experience. Taking in such gorgeously, unbelievable places like that in person makes you realize how amazing and wondrous our world is! Not only were the natural formations incredible, but our guide gave us a full history of the caverns. We heard a lot of interesting things, including the story of how the caverns were found by two young boys, who for a very long time had the caverns all to themselves. Tuckaleechee Caverns are definitely worth a visit! Rain or shine we loved all that Great Smoky Mountain National Park had to offer and I would be willing to bet we only saw a tiny portion of it! Hopefully we will get back there soon! Until next time!! Anything at Great Smoky Mountains NP that we need to hit up next time?! The caverns look super adventurous! I'd be up for any of these activities though - even though I have to admit that the mill looks a bit haunted in the rain! It did have an eerie vibe between the rain and the mist! They are the best for sure! The Great Smokey Mountains are a favorite destination for us as TN residents. No matter how many time you go there is always more to see and enjoy! I'm sure!! I would be there all the time if I lived close. I think America's National Parks are one of the very greatest things about the country, and I love the aim to visit all of them! An amazing goal. And I remember how good the visitor centres were in the parks I've been to, I'll definitely add Great Smoky Mountains to my list! There really are one of the shining jewels! I just pray they stay protected. You really do! It was wonderful! Yes! I love all the changing scenery!! I think that National Parks are absolutely beautiful, especially when they are covered in rainclouds. I recently visited Zion with my family and it was really misty and rainy when we were there. It was so beautiful just to drive around. I wish there was some place like the Tuckaleechee Caverns to go underground for sure! Ahhh Zion!! I can't wait to visit!! I have a goal to go to all the national parks. And when I went to Acadia, I endured a lot of rain too! We loved it too! Yes, if you make it you need to check out the winery! If they don't know about it, you will have to give them the heads up. It's such a sweet little spot!